See the recap of the chat over here. The U.S. Secretary of Transportation Anthony Foxx and Chairman of the House Transportation & Infrastructure Committee Rep. Bill Shuster will be taking to Twitter today to answer questions about reauthorizing U.S. surface transportation; strengthening the Nation’s highways, bridges, and transit infrastructure; and the future of transportation in America. 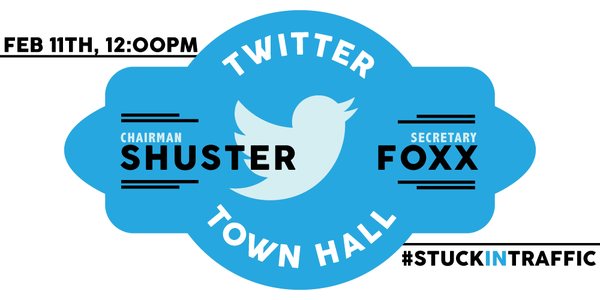 Follow @SecretaryFoxx and @Transport and keep up with the #StuckInTraffic hashtag. The Twitter Town Hall officially begins at 11 a.m. central.